Shine Your Face gets a vote for Surprise Excellent Album Discovery of the Year. Mr. Something Something is a band. It's an all-white Afrobeat quintet from Toronto with strong jazz and funk influences, but that can be easy to forget while reading the press materials. Most of the buzz this group has scored ("National Geographic? You'd better believe it!") comes from the band's savvy with eco-technology, particularly its bike-powered sound system, "The Sound Cycle", which powers the band's amps and speakers by enlisting helpful volunteers from the audience to pedal to the music. OK, that’s actually pretty awesome, but so is the music: a dense, multi-layered and polyrhythmic sonic steamroller of funky African repetition and old jazz chops. 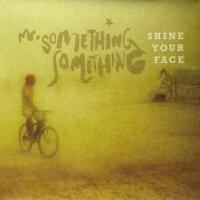 The arrangements on Shine Your Face sizzle; time signatures flail on the side of complexity; John MacLean’s tenor sax interjects in the spaces left by the voodoo churn of Paul MacDougall’s palm-muted guitar, Liam Smith’s bass, and Larry Graves’ mountain of drums. Tempos are usually quick, and more often than not, the instrumental intensity and musicianship on display is almost intimidating. And that’s all before even mentioning the voice. Johan Hultqvist’s pleas are mood sensitive, passionate, and soulful-beyond-his-time. On songs like the euphoric “Make Your Mind” and “Only the Maker”, he demonstrates such a brilliant range, the harmonies he provides to his own lead vocals almost sound like a different person. Were you looking for my vote for Surprise Excellent Album Discovery of the Year? Well, you found it.